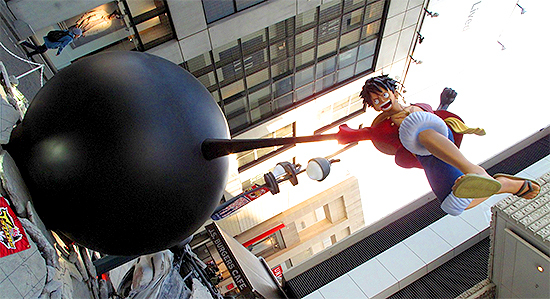 In order to debut the newest crossover video game based off of popular Shonen Jump manga characters, titled J-Stars Victory Vs., Bandai Namco has created a life-size diorama in the middle of Tokyo, featuring world-famous characters Goku and Luffy duking it out! 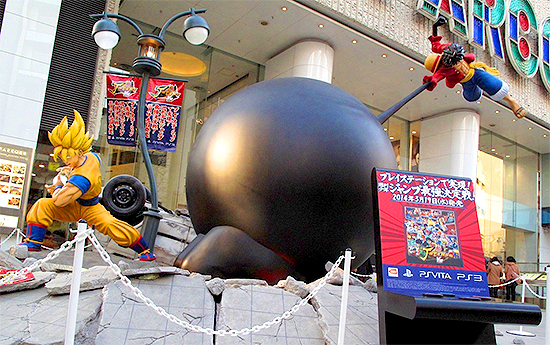 this display features both character performing their signatures moves amid fake rubble, debris, and even an overturned car. The display, which features an interactive panel that activates sound effects and the characters’ voices, will be open to the public until March 23rd. Bandai Namco, also displaying posters with different match-ups from the video game across Shibuya train stations, hopes to make this anniversary game a big fan favorite, and has pulled out all the stops in order to commemorate the game’s release. 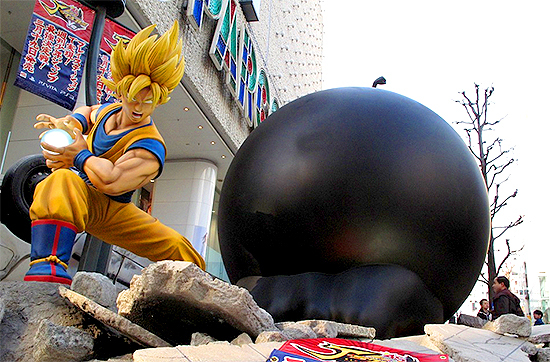 Dragon Ball is a manga series written and illustrated by artist Akira Toriyama. It was originally serialized in Shonen Jump from 1984 to 1995, and was adapted into two anime series, Dragon Ball and Dragon Ball Z, which were broadcast from 1986 to 1996. The series follows the adventures of the protagonist, Goku, from his childhood through adulthood as he trains in martial arts and explores the world in search of the seven orbs known as the Dragon Balls, which summon a wish-granting dragon when gathered. The series has since become one of the most successful manga and anime series of all time, with 18 movies, a variety of spinoff material, video games, merchandise, and more. One Piece, a manga series by Eiichiro Oda, is an ongoing manga series since August 4, 1997, with over 740 chapters and more on the way. Following the adventures of Monkey D. Luffy, a young boy whose body gains the properties of rubber after unintentionally eating a Devil Fruit, Luffy explores the ocean with his pirate crew in search of the world’s ultimate treasure, known as One Piece. The manga has sold over 345 million volumes worldwide, making it the best-selling manga series in history, and has since been adapted into an ongoing, 600-episode anime, as well as a variety of theatrical releases.